Silvermine has long been considered one of the most beautiful areas in Connecticut, and perhaps, in all of New England. As such, our tri-town area has attracted artists, writers, inventors and others from all walks of life. Silvermine also enjoys a unique history legacy, one that many community members are working hard to preserve. 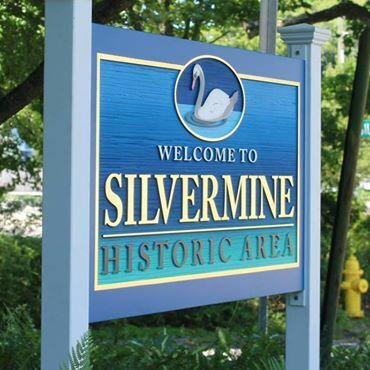 In the Spring of 2006, the Silvermine Community Association (SCA) embarked upon an exciting project to visibly mark Silvermine’s boundries in a way that connects this creative and historic heritage. There are sixteen key ‘gateways’ where residents and visitors enter into Silvermine. 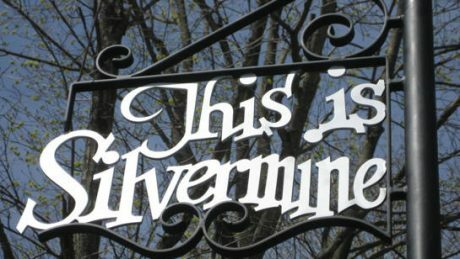 At these locations in Norwalk, New Canaan, and Wilton, we have placed a replica of the iron “This Is Silvermine” sign. The original signs were created in 1963 through a collaboration of John Vassos, Clifton Meek and Granville Ackermann. In order to do this, we solicited the financial support of members of the community to sponsor the signs. The response was overwhelming!. In return for their support, the donors have received a lifetime membership in the SCA and a commemorative plaque on their sign and our hearty thanks! More information about the history of these beautiful black and silver signs and the location sites can be found below. The signs all were been completed by a native of Norwalk, Steve Stefanidis of Steve’s Custom Iron Works in Norwalk, who beat out 18 other bidders with an excellent price and quality workmanship. In addition to his quality workmanship, Steve is a real artist! Under the direction of The SCA’s Gateways and Thresholds Committee, headed by Peter Viteretto, signs were installed at the Silvermine gateways in Norwalk, New Canaan, and Wilton. The first Norwalk sign was installed by the Norwalk DPW on Wednesday, September 5, 2008 by Norwalk’s Department of Public Works. New Canaan’s and Wilton’s DPW’s later installed signs in their respective towns. The Silvermine Community Association is extremely grateful to these three DPW’s for their generous support of the project. The identification of the boundaries of the area known as Silvermine was initiated in 1962 by the Silvermine Community Association (SCA). A special Boundaries Committee was formed to undertake this task. This committee researched and utilized various documents and historical records that included zoning and geophysical survey maps; early postal routes; charts of analysis of the Silvermine River and its tributaries; and historical documents of the Towns of Wilton, New Canaan and City of Norwalk. Once defined, the committee agreed that a symbol was needed to secure the identity and heritage of Silvermine. John Vassos, an internationally renowned artist and industrial designer who fashioned many technological household items of the early 40’s and 50’s, along with Granville Ackermann, also an accredited industrial designer, requested the talents of their Silvermine neighbor, Clifton Meek, to develop a design for a sign to be placed at the thresholds of the community. Meek, by this time, a noted cartoon artist whose depiction of a barnyard mouse inspired a young Walt Disney, also was a skilled metal smith and founder of the Silvermine Forge. A hand sketch by Meek in the fanciful lettering “This Is Silvermine” was to become the symbol of the community embodying its artistic tradition. SCA presented the boundaries and mock-up of the sign to community and town officials at the Silvermine Tavern in March of 1963. Consent of community members, as well as approvals of the political leadership for establishing boundaries and implementing was obtained at that time. Signs were fabricated at the Philips Company Iron Workshop on Water Street in South Norwalk and installed by the close of 1963.